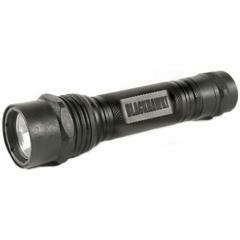 The Blackhawk Legacy X6-P is a reduced-weight version of the original Legacy X6 tactical flashlight. It is made from a durable polymer instead of aluminum, and features an anti-roll head that keeps it in place when set down. he textured body provides a secure grip, even with gloves. Its Xenon lamp delivers 65 lumens of bright white light. The tailcap switch provides constant and momentary activation modes for versatility. Its clear glass lens and pre-focused, calibrated beam provide even illumination with no shadowed areas, ensuring that your target has no place to hide. Unfortunately a pressure switch is not available for this light.